Peace One Day is a non-profit organisation founded by the British documentary maker and former actor Jeremy Gilley. It was set up to mark 21 September as an annual Peace Day of global unity and intercultural cooperation. Ve Interactive volunteered to build and donate a new website to the organisation after the agency's communications director, Kathy Heslop, interviewed Gilley for the firm's blog. The original site's content was incompatible with different platforms such as mobile devices. It was in English only and did not reflect the organisation's global outlook. 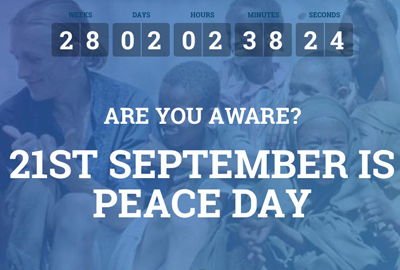 The site is designed to nudge people into taking action, such as raising awareness through social media, donating, buying tickets to Peace Day events, or organising their own event, to mark 21 September. The landing page asks "are you aware? ", aiming to capture users' attention. Gilley's video content has been reorganised under headings. The new site is more interactive than the old one and available in all six official languages of the United Nations, plus Brazilian Portuguese. This reflects the fact that UN member states voted to adopt the first-ever annual day of global ceasefire and non-violence in 2001. "The biggest difficulty was how to engage new visitors who had no knowledge of Peace One Day. Visitors to the website need to understand the content and the organisation before they are inspired to take action. The content had to be direct, visual and engaging to keep their attention."